You’ve got to hand it to Pete Johnson, the creator and owner of Tatuaje. His annual Monster Series release is pure marketing genius. Every year, Tatuaje’s growing army of devotees seeks out the Halloween limited release, many buying an entire box before trying a single cigar. Back in 2011, Cigar Aficionado wrote an article about the “distribution nightmare” the Monster Series had become. Back then, the release was only in its fourth year, with production at 22,000 cigars; the latest release, called the Krueger, clocked in at just shy of 60,000 cigars. For the uninitiated, Tatuaje has released an annual Monster Series smoke since 2008, each celebrating a character from the horror genre, including The Frank, The Drac, The Face, The Wolfman, The Mummy, The JV13 (Jason), The Jekyll, The Hyde, and The Krueger. The MSRP is always $13, and there are typically 666 “dress boxes” of 13 cigars made available to 13 “unlucky” retailers (Johnson also releases plain boxes of 10). I didn’t have a chance to get my hands on The Krueger when it came out last fall. Thankfully, I spotted a stash at my local tobacconist and picked up a handful. As the name would suggest, The Krueger honors the Freddy Krueger character from A Nightmare on Elm Street. Its recipe calls for a Mexican San Andrés wrapper around Nicaraguan binder and filler tobaccos. Typically, wrapper leaf is judged by both taste and appearance. A testament Johnson’s aforementioned marketing genius is his ability to use ugly, scary-looking wrapper leaves that, while tasty, certainly wouldn’t qualify for most $13 cigars. Indeed, The Krueger is a dark, rough, and rugged box-pressed torpedo (7 x 48). Its dry surface is characterized by plenty of veins, lumps, and tooth. There are hardly any oils to be found. It is slightly spongy and the cold draw is moderate. After setting an even burn, pungent pre-light notes of earth, cocoa, and hay transition to an initial profile that’s balanced and medium- to full-bodied. Flavors include coffee bean, roasted nuts, leather, black pepper, and sweet cream. That earthiness (some might say dirtiness, or grittiness) so emblematic of San Andrés tobacco creeps in as the first inch is concluding. As the midway point approaches, the profile remains consistent, but the flavor settles a bit as the cigar takes a more balanced and nuanced stance. The sweetness ramps up with the addition of chocolate, and the leather and roasted nuts become more pronounced. The final third is marked by a reprise of the intensity from the outset, plus heavy notes of leather and a sour meatiness. 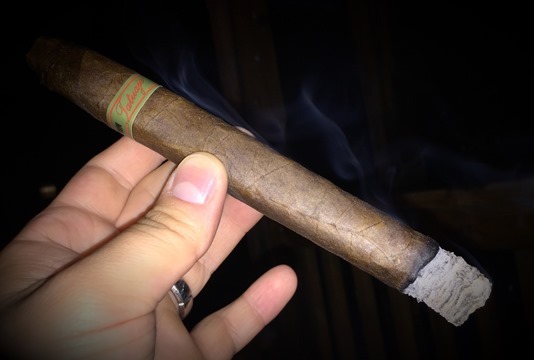 With solid construction from light to nub, The Krueger is a fine, well-built cigar with loads of rich flavor and ample changes throughout to keep things interesting. That said, I don’t believe it quite stands up to the lofty expectations set by its Monster Series predecessors (and its price and pedigree). Perhaps that will change with some age. For now, the most fitting rating for this Tatuaje creation is three and a half stogies out of five.